Most of the radiologists and administrators I've met are gadget folks and tend to be all about customized workflow. 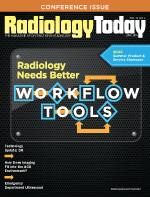 That very concept comes through in David Yeager's article on IT workflow tools in radiology. Yeager talks to experts in the field who bring very different ideas about the emerging generation of radiology informatics workflow tools. Depending on your job in imaging, your needs can vary greatly in terms of image viewing, interpretation, report generation, distribution, storage, and access. That's without considering the reimbursement components. Putting together the hardware and software to achieve what you want becomes a balance between customizability to do what you need done, standardization to keep it affordable, and interoperability to make it all work together. Some of the workflow ideas discussed in Yeager's story (on page 12) include prepopulating data into report templates, automated lesion tracking, and clinical context software that pulls data from an EHR and puts them into the PACS/RIS environment to aid the radiologist in interpretation. Also in the issue, Timothy W. Boden, CMPE, writes about radiology's role in accountable care organizations (ACOs). Boden interviewed professionals who share some interesting thoughts on where radiology groups fit into the risk-assuming ACO world. To be sure, IT tools and data crunching will have their role in that environment. But putting the tools together so they help you do your job is an evolving process. For years, I've been searching for my personal device convergence: that individualized combination of smartphone, tablet, laptop, and music tools that will integrate my work and personal digital lives with minimal performance trade-off in any important area—while basically fitting in my pocket and reducing my personal device count to one from the current four. (You can stop laughing at me because I am pretty sure you've tried to do this, too.) It has been a long search, thwarted by my need for good keyboard access as an editor. But later this summer at the AHRA annual meeting, I hope to field test the latest attempt at this convergence—a Samsung Galaxy Note 4 phablet with loads of storage and a Bluetooth keyboard, which some might consider a device in its own right. I'm also evaluating Microsoft Office and social media and cloud storage apps for Android. As with all significant workflow changes, there is reluctance to give up the old way, which means my backpack may well be filled with backup devices when I head for Las Vegas, in case the convergence fails. Keep working on your workflow and enjoy the issue.